After a devastating comeback loss against Fairleigh Dickinson University, The St. Francis Men’s Basketball team (13-8, 5-3) defeated Mount St. Mary’s (5-16, 2-6 NEC) with a final score of 74-67. Since the opening tip-off, the Terriers went on a scoring outburst as they went on a 19-4 run in the first 10 minutes of the game. 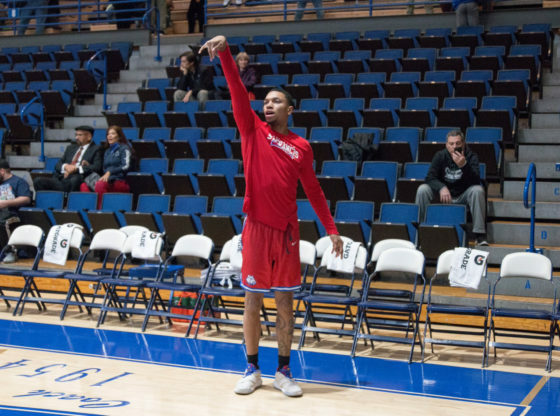 15 points was the largest lead of the night for the St. Francis Terriers. St. Francis had the lead up to 15 points in the game until Freshman Vado Morse on MSM’s hit a free throw to bring the game to a 10 point deficit. Just as the Mountaineers thought they were getting back into the game, the Terriers kept their scoring momentum going as they found themselves back in a 15 point lead at the half. The Terriers started showing their defensive side of their team in the start of the second half as they were able to have Malik Jefferson on the Mountaineers miss two straight shots along with a block by Deniz Celen on the Terriers. The lead stayed relatively large until Vado Morse was able to bring the deficit within single digits as he made a three pointer to put the Mountaineers down by 9 points with less than 4 minutes left in the game. At the 49 second mark, Morse came up clutch with another three pointer to put his team down by three points. This caused to the Terriers to call a timeout. Glenn Sanabria on SFC was fouled and made two free throws to bring the Terriers up by 5. Freshman Stevan Krtinic knocked down a three pointer of his own to seal the deal. Rosel Hurley would be the Terriers leading scorer in today’s game finishing up with 16 points, 6 rebounds, and 3 assists while going 6-12 (50%) in shooting. Deniz Celen was able to put up his second straight double-double as he finished with 15 points and 10 rebounds. Along with his points and rebounds, Celen also finished with a career high of 4 assists. Jalen Jordan would also score 15 points for the Terriers in today’s matchup while shooting 7-13 (53%) from the field. As for the Mount St. Mary’s Mountaineers, Vado Morse led the team in scoring as he finished with 21 points, 7-13 (53%) shooting, along with 4 rebounds. The St. Francis Men’s basketball team will now play their next game this Thursday, January 31st2019, on the road again against Central Connecticut State University at 7pm. Racial Disparities in Health — are we really post-racial?